Unplugging from the electrical grid was easy, or relatively so. What we didn’t realise was that we needed the human grid, too. We could replicate it for a while, in our beautifully isolated little neighbourhood, but in the end the longing for deeper, sturdier, more numerous human connections pulled all of us away from the mesa. From a nice account of living in a remote commune and then returning to civilisation. This nicely demonstrates a point I’ve been pressing since the first issue of New Escapologist. You can always come back. 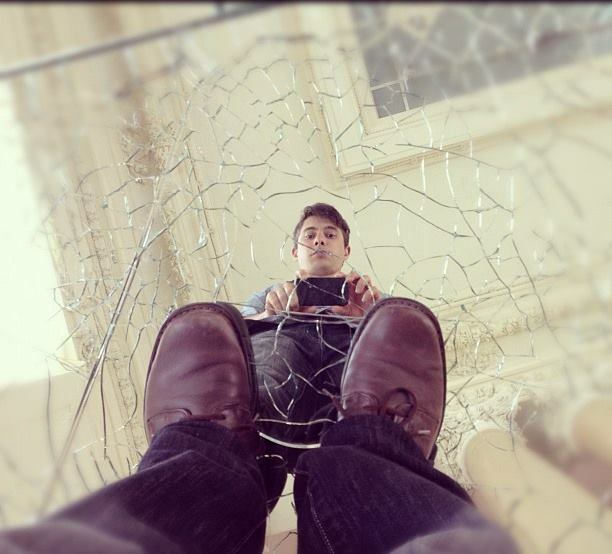 Escape is not an irreversible reaction. My family’s 15 years there changed the land, and it changed each of us. In our new town, we live just a block from a lively main street, in a house where the toilet flushes, the lights never dim, and the neighbours’ dinner conversation floats over the back fence. But we don’t use any more power than we did off the grid, and we drive less. The habit of frugality has stuck, so much so that it’s no longer a hardship. Now I see the mesa as a kind of training ground, a place that prepared us to begin another experiment. We’re trying to take what we learned off the grid and sustain it in a new place, one that’s embedded in society instead of isolated from it. Buy the all-new Issue Nine in print or on PDF here. 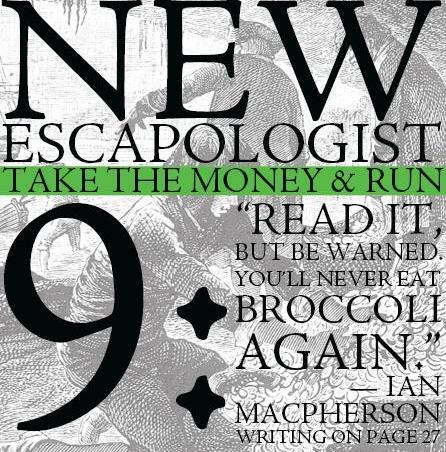 Buy the complete back catalogue of New Escapologist with a 10% discount here. Buy the complete back catalogue on PDF, with £1 off the price of each issue here. An employee is a zombie, a set of phantom limbs disconnected from the alien mind that commands them. Professionalism is about squelching your values in favour of those in your job description — a sheet of paper in a filing cabinet somewhere, ominously collecting dust like the picture of Dorian Gray. 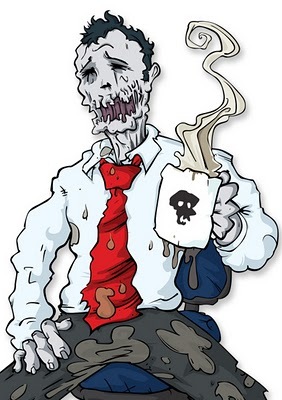 I love being an Office Zombie, it makes all my bosses richer! Wehey! 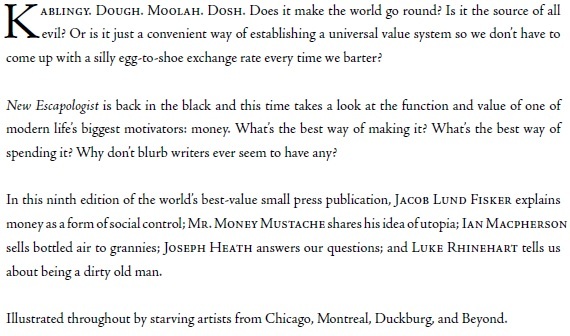 Some cool kid has posted a preview of New Escapologist Issue 9 on some kind of new-fangled Internet video platform. Don’t wait for the perfect opportunity, just start taking action, using what you have, who you know, who you are. Take it from me. New Escapologist‘s eudaemonology (science of happiness) editor, Neil Scott, knows an awful lot about productivity, satisfaction and mindfulness. This document, then, is a kind of holy grail: everything Neil has learned about productivity and lifehacking in the past seven years. A comic strip with an Escapological theme. Drawn by Gavin Aung Than. Spake by the hilarious, principled and all-round wonderful Bill Watterson. Coincidentally, I’m posting this on the day of the London Anarchist Bookfair, where New Escapologist is being represented. I’d like to say a few words about escapism. I hear the term bandied about as if it’s a bad thing. As if “escapist” fiction is a cheap opiate used by the muddled and the foolish and the deluded, and the only fiction that is worthy, for adults or for children, is mimetic fiction, mirroring the worst of the world the reader finds herself in. This is Neil Gaiman on the joys of reading, the importance of libraries and books, and the value of escapism. (Escapism is different to Escapology, remember, but Neil Gaiman in the above passage shows that it provides the faculty to see that your life or the world in which you live does not necessarily have to be the way it is — or any given way for that matter). There’s a lot to like in this essay (originally a lecture). I was struck today by the strangeness of the word “tabloid”. I was reading an essay on the Web and I think I may have been expecting the word “tablet”. “Tabloid” struck me as more futuristic-sounding than “tablet” and for a tiny moment I wondered what a tabloid might actually be. Some kind of new interface? A clever bit of portable tech? Astronaut food in pill-form? Of course not. It’s a tabloid. An ink-and-paper publication, usually about celebrities and fashion and UFOs. My weird outsider life means I haven’t seen a tabloid newspaper for years and I’d sort of forgotten about them. It was exactly like how I once struggled to convince myself that coca-cola was a real thing. I think I’m properly beginning to identify with the protagonist of that novel, À rebours. This is what the blurb looks like on the back cover of Issue Nine. Gilderoy, let me just tell you what it is to be a professional. It’s very simple. You cooperate, you don’t question. You don’t argue. You don’t look at your watch. You just do the work you’re told to do and keep your personal opinion where it belongs. Am I clear?